Mixed in with the many other International Fiberglass muffler men versions was one that is rare and fairly uncommon. However in my continuous search for muffler men I have run across enough of them to realize that they are a version all of their own although it seems less then 10 were made. We call them today by the name that was often printed on their shirt “Mr Bendo”. I have spent more time then I had planned scouring the internet for clues and information about this Mr Bendo. 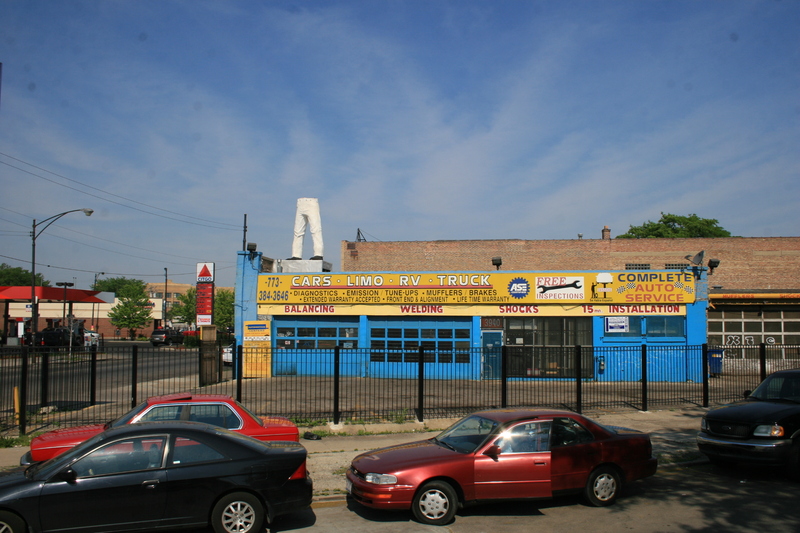 It seems he was popular with auto repair businesses but a chain by that name doesn’t seem to have existed. Adding to the mystery is the fact that these giants are not concentrated in one state or area but strewn about the US from Texas to Indiana with one even in Sioux Falls. The ones today all look the same for the most part and come with white pants, red shirt and a bunyan face without the knit cap. They also normally had the indian arm positions with the left hand at the side and the right arm up but instead of a salute Mr Bendos all clutched an iron bar in their fist. 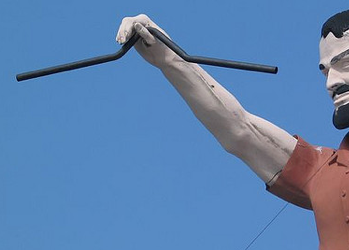 The bar was often somewhat bent suggesting the giant was strong and able to bend iron, maybe thats where the name came from. The name “Mr Bendo” was often printed in white letters on the right side of the chest. To this day I have yet to find the story behind these rare versions. While our American Giants crew was making their was through Chicago last summer shooting for Episodes 5-7 we came across one of these rare iron bar holders on Grand Ave. Sadly he has seen better days and is one of a few unfortunate muffler men across the country to be missing some very essential body parts. 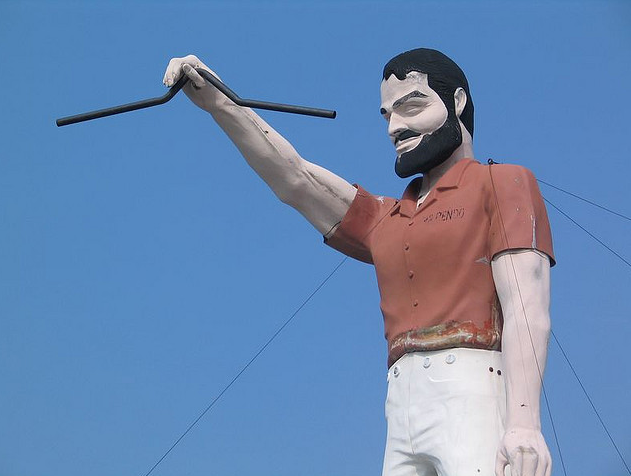 Way back in the day the auto repair shop who’s roof he stands on was called Ted’s Auto Body and was first reported on Roadside America in 1997. I am guessing he stood there for many years before that first report came in but his life changed on Friday June 18th 2010 when a storm came through and knocked everything from the waist up down onto the roof. 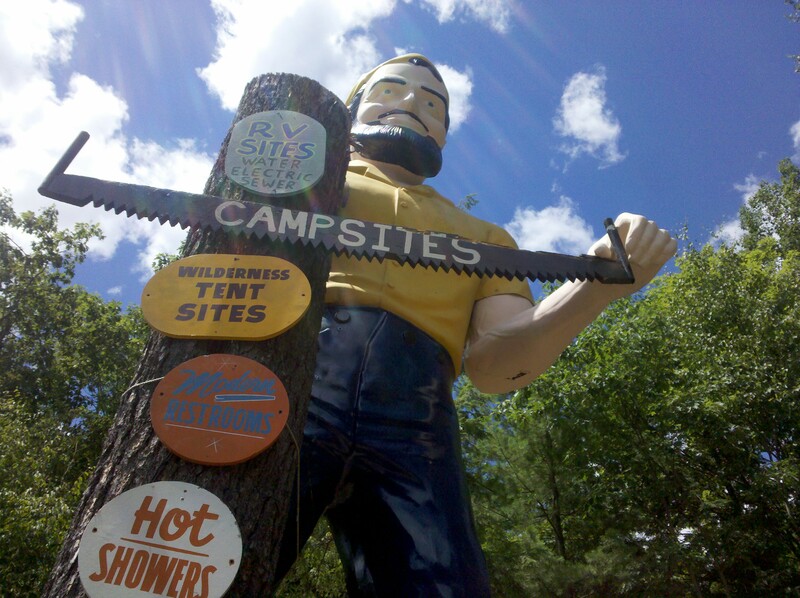 The incident was quickly reported online on Roadside America and a few other websites known for their muffler men information. The workers at the shop soon recovered the detached body parts and shortly after the head disappeared. 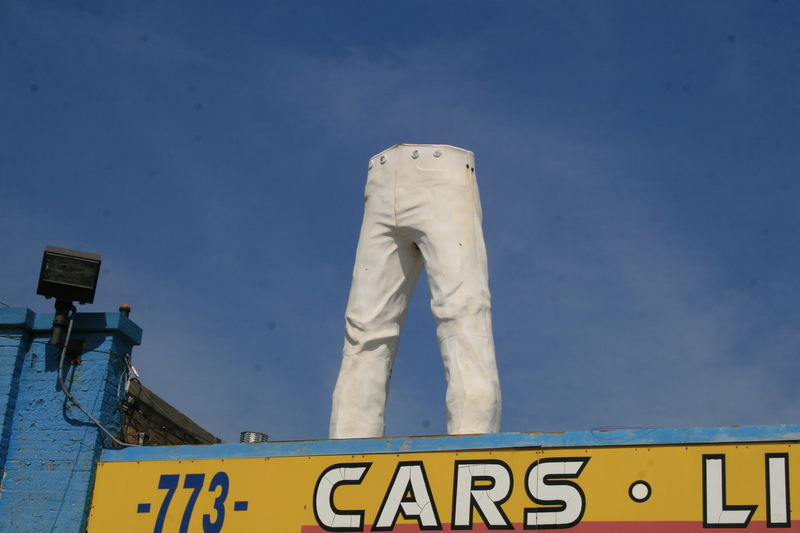 They stored the torso but without a head nothing could be done with the giant and so those sad looking pants have stood on top of that roof for 3 years now. In 2012 Dean Hickstein reported on R.A. that it had been two years since the giant stood complete on the roof and noted that he was “only half the man he used to be” and asked for the publics help to find the missing head. This tactic has actually worked in the past and in 2011 a head was returned to a giant in NY after the owners posted a plea for help on Roadside America (see picture to the left). 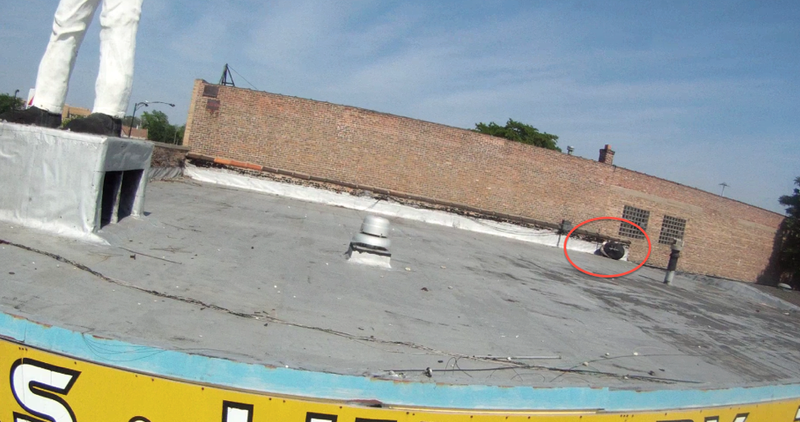 Our A.G. crew arrived on May 21, 2012 and almost right away we pulled out the go pro for a quick roof inspection. I quick look at the footage showed nothing of interest and we shot our B roll and interviews and went on our way. It wasn’t until months later when I was editing some shots that I took a better look at those few minutes of go pro footage. There against the back wall of the roof was what looked like a head turned away from the camera with it’s face to the wall. By that time more then a year had gone by since our stop on Grand St and a call to what is now Ced’s Muffler and Brakes sent a worker scrambling up on the roof to have a look. Sadly the head was gone and we had no idea where it ended up. It was not until October 2014 that the head was finally located during the sale of the giant. After Ceds closed it’s doors and went out of business, Free Time Hobbies in Blue Ridge, GA purchased the Muffler Man and hauled it to southern GA for a complete restoration. Today the Mr Bendo is called Mr Hobbie and he stands in Blue Ridge, GA and the brand new store location. I want to thank the guys at Ced’s for taking the time to talk with me about the disappearance of their m man head. Also a bit thank you to “Annoyance” and their flicker account for sharing with us the picture of Mr Bendo in better days. 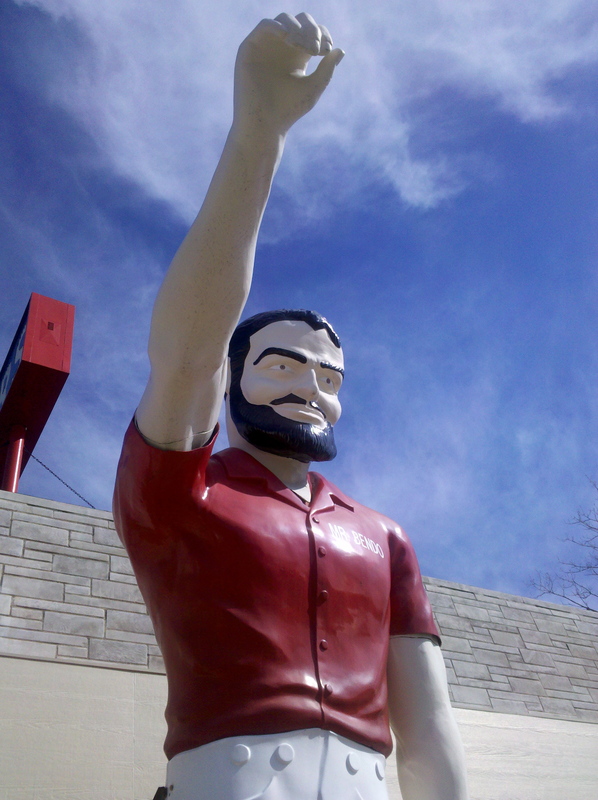 Also to the guys at Free Time Hobbies for doing such a great job of saving this rare Muffler Man and sending us pictures!